Outfitting a little one in Easter baby shoes is the finishing touch proud parents need for an adorable springtime ensemble. Just because your baby isn't walking yet doesn't mean you can't buy her shoes. Many parents feel that a young child just isn't fully dressed unless she's wearing shoes, or at least booties. For babies, soft and comfortable footwear should be a priority over looks. Fortunately, you won't have to worry about soft soles getting dirty since a baby spends most of her days sitting, lying down or crawling, not walking. What Should Your Infant Wear to a Special Occasion? The traditional hard-soled white shoes for baby are still around, but today's parents have many more options. Before purchasing shoes, you should already have an outfit or at least an outfit in mind. You may find other colors besides white that accessorize well with your baby's dress or suit, though white shoes for Easter will probably never go out of style. When looking for shoes for Easter, consider what your activities are for the day. Babies usually aren't up to much more than playing with plastic eggs and watching older kids participate in an Easter egg hunt. Keep baby comfortable in soft shoes and take them off if he seems uncomfortable. Just be sure to take pictures early while he's still clean and unfussy. Baby Discovery: Tiny pearl-type beads and pretty details adorn a formal white shoe for girls, while baby boys can wear a basic black tuxedo shoe. 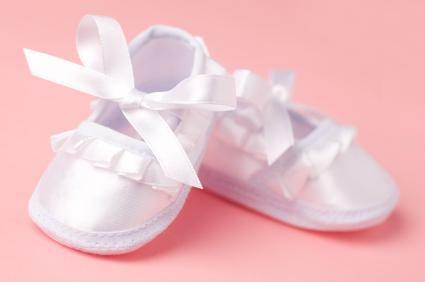 Newborns of either gender will look cute in an allover soft, satin white shoe with laces. Tux 'N Lace offers a dainty white shoe for girls, featuring a satin flower and rhinestone accent on the front of these Mary Janes. Sophias Style: You'll find several Mary Jane styles in white and pink, along with sandals and shoes decorated with floral accents. Any of the footwear choices available will complete a baby girl's Easter dress ensemble in the most adorable way. CarouselWear is all about making your baby look precious, no matter the occasion. White baby shoes are available in an allover soft cotton and will fit babies from three to six months-old. Hand-smocked, this style also comes in pink. You'll also find a buckled shoe with a flower design. Made of leather, this Mary Jane style is great for baby girls. Baby Ultimate offers a larger selection of baby boys' shoes than most places, which is sometimes a challenge for parents who have boys. If you're looking for dress shoes for your son, this site may have just what you need. Lace-up oxfords in white or brown, black patent leather oxfords, white leather bootie-type shoes and saddle oxfords are all available to complete your little one's sailor suit or Easter tie-and-suit combo. For girls, the selection is even more varied. Mary Janes come in black, white, pink and yellow varieties -- some feature bows, flowers and stitched hearts. You'll also find sandals if that's what you're after. Parents almost always want to dress their babies up for Easter. There's sure to be plenty of frilly bows, ribbons, ruffled socks and adorable little suits. Baby shoes will give your newborn or infant the perfect finishing touch to his or her springtime outfit.